There are ordinary timepieces that function with precision then there are TAG Heuer watches made with style and accuracy that goes beyond the standard. 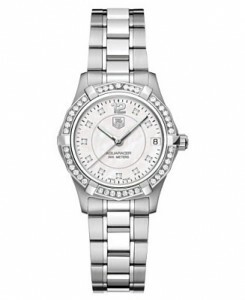 The TAG Heuer Aquaracer WAF1313.BA0819 for women is another exceptional timepiece that is absolutely stunning. The body of the Aquaracer timepiece is made of gorgeous brushed steel with two tones in the links. The face of the watch contains 42 unidirectional 10 Wesselton diamonds in the outer circumference. Inside is real mother of pearl with polished silver hands that illuminate. Scratch-resistant sapphire crystal overlays the face of the Aquaracer women’s timepiece with a tightly sealed backing which makes it water resistant up to 984 feet or 300 meters. A steel clasp with push button release holds the stainless steel wristband together. The TAG Heuer Aquaracer is made with genuine Swiss quartz movement, a signature mechanical design by TAG Heuer. The subtle beauty of this timepiece creates a luxurious look to a watch that can worn for the active woman or the casual dresser. The average retail price for this timepiece is around $4,000.00.